Today's standard calendar, introduced by Pope Gregory XIII in 1582, is unnecessarily difficult to use. The daily change of the date and the arbitrary number of days in each month demand mental effort to remember. People primarily order their schedule by the day of the week, which is totally unrelated to which day of the month it is. 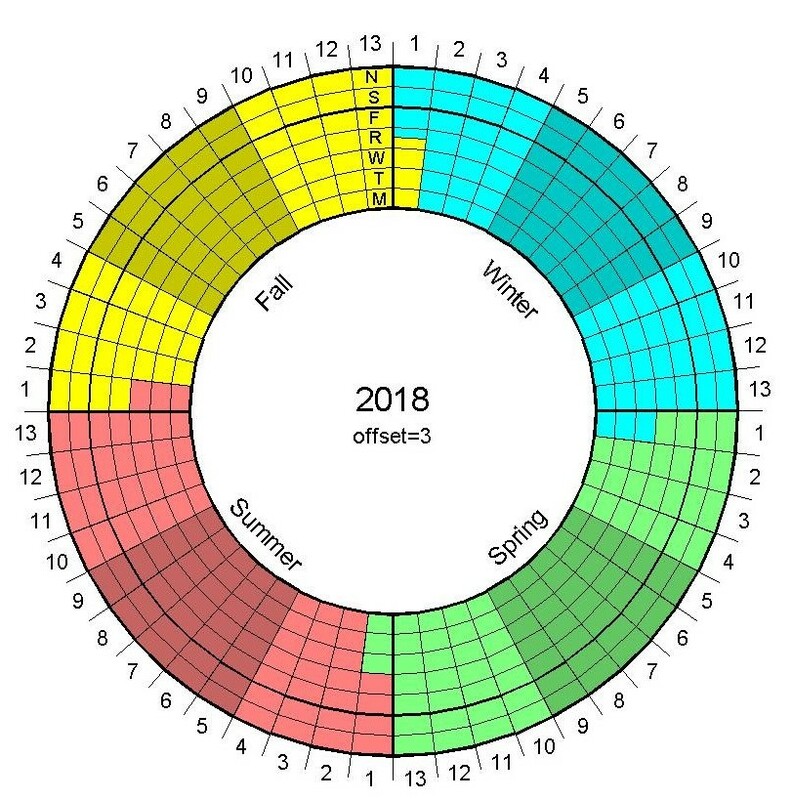 Days, weeks, and seasons of the Heptal Calendar. The Heptal Calendar takes its name from the Greek word for "seven" because it is based on weeks rather than months. The day of the year is completely defined by the season, week number, and day. An example of a date in this system is "winter, week 5 Thursday," abbreviated to "win 5 Thu" or "w5R". Since the week number stays unchanged for the entire week, it's easier to remember that the current week is 6 (for example) than that today is the 23rd of the month (or was it the 24th?). Setting the date for a future event using the Heptal calendar automatically tells us how many weeks between now and the event, and on which day of the week the event will occur. and a year has about 365.25 days, the starting weekday of the season drifts from year to year. For instance, if Winter starts on a Tuesday one year, in the next year it will start on Wednesday (or on Thursday in a leap year). See the FAQ's for a few other details of the system. Example showing winter weeks 10-13 and spring weeks 1-4. The Spring equinox occurs on a Wed (20 March). 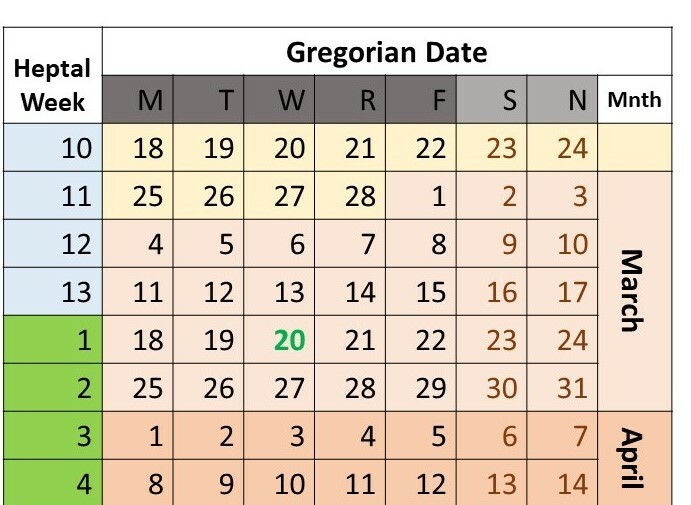 One can convert between the Gregorian system and the Heptal with a printed calendar (or app) that includes an additional column to label the number of each week (see figure). Should the Heptal calendar ever come into general use--as it should--the season/week/day system will describe dates without any need to reference months. The Gregorian calendar is based on arbitrary divisions inherited from the Roman Empire. Its months no longer serve their original purpose, to keep track of the phases of the moon. The Heptal calendar is based on the seasons, a natural rhythm experienced by all people on Earth, and weeks, our ubiquitous social division of time. The Gregorian calendar is difficult and ugly. The Heptal calendar is convenient and elegant.